Late winter is acacia time around here. Our Cootamundra wattle (Acacia baileyana 'Purpurea') is now 20 ft. tall and covered with blossoms. This is one of the first branches with open flowers. I love the contrast between the bluish-silver leaves and the golden-yellow puffball flowers. 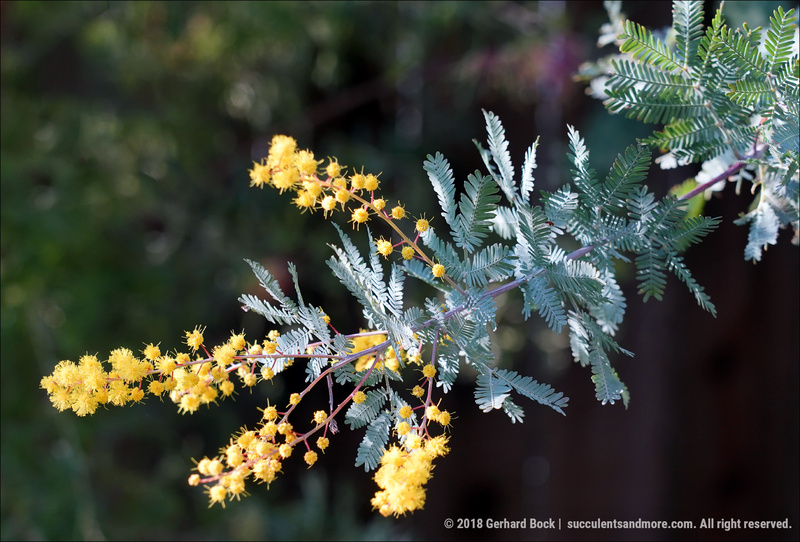 This is the first time this acacia has flowered. Such a pretty thing. I wish I could risk the ire of my neighbors for further blocking their views with yet another tree. Mine is getting ready to flower too! I have mine in a large pot-transplanted from a 5g, and it has surprised me by blooming !